Wondering what to give that special someone as a gift or token of your appreciation? There may be hundreds of choices in front of you, which will make the process a little difficult. There is a sweet way out of it, though. Go for something that everyone loves and can never go wrong: chocolates. All types of gifts are good, but nothing says “I love you” or “you’re sweet” better than a box of chocolates. After all, almost everybody loves chocolates. According to statistics, around 58 million pounds of chocolates get sold on Valentine’s Day alone in the U.S., and an estimated $1.7 billion worth of candy purchases usually happen during the week of February 14. Imagine that number blow up when thinking about a whole year’s sale. Apart from being popular gifts, this confectionery has another reason for you to smile. Here’s what science has to say. Dark chocolate, with 70% cocoa, is good for your oral health. It is a rich source of polyphenols, which limit oral bacteria. This acts as an antioxidant that neutralizes bad breath-causing microorganisms and prevents bacteria from turning sugar into acid. Dark chocolate contains flavonoids that slow tooth decay. Recent studies have found chocolate effective in fighting cavities, plaque, and tooth decay. The cocoa shows antibacterial compounds that are also found in mouthwash and toothpaste and are known to fight plaque. Chocolates contain the chemicals tryptophan and phenylethylamine, which help increase serotonin production. Serotonin is a type of chemical that acts as a neurotransmitter, distributing signals around the brain area and consequently stabilizing moods. Increased amounts of serotonin in the brain will make you feel good. Chocolate treats with higher cocoa content can boost serotonin from endorphin secretions. When eating chocolates, most people commonly ration their share throughout the day (obviously to ensure they have something to nibble on the rest of the day). However, the enamel softens each time you eat or drink and takes up to 30 minutes to re-harden. 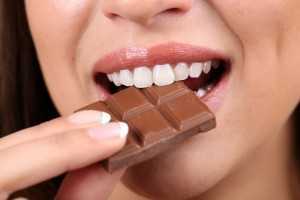 So if you eat chocolate throughout the day, your enamel is constantly under attack. Dentists recommend to eat the candy all at once and to drink water to rinse away the sugar. Of course, nothing beats brushing and flossing to maintain the health of your enamel and gums. Gentle Dentist, a dental practice in Indiana, reminds people that high-quality oral hygiene still gives teeth stronger protection than any other alternative. With all the health benefits of chocolates, you should feel special when someone gives you a box of this tempting treats – the more reason to boost your oral hygiene habits, so you could flash that special person the brightest, sweetest smile.